I’m a girly girl at heart and usually feel my best when I’ve at least but on a couple coats of mascara! Most days I do a quick 7-minute makeup routine and put my hair in a topknot. Here you’ll find my beauty and hair posts including my over-40 skincare routine, my experience with microblading (wish I’d done it sooner) and lash extensions (took them off but miss them), and my easy hair curling tutorial for loose waves. My Take Care of You post was one of my most popular ever, and I’ve been blogging for 8 years! Y’all loved the wise advice from my Grandma Nola and she got a kick out of it too! I was talking on the phone with her last week and she was telling me that at her age, 91, she remembers the past way better than what happened yesterday. She has wonderful memories of growing up healthy and happy in rural Missouri, being raised by her Aunt Bernice and Uncle Mack. They lived very modestly on the farm and didn’t even have electricity. I grew up with parents that had me as teenagers. I’m 43 now and my beautiful Mom is 59. She had to leave high school for a while after she had me, but went back later to get her diploma. While she was working and going to school, I stayed home with my Grandma Nola. What’s funny is that Grandma Nola isn’t my blood relative, but she’s one of the people I’m closest to in my life and one of the most influential. I love her so very much. Good morning friends! How was your weekend?! Are you getting ready for Fourth of July?! We didn’t make any plans other than to chill out at home and then head to the pool! Maybe we’ll go see some fireworks since Houston puts on a pretty good show! I want to give each and every one of you the biggest bear hug for showering James with such kind comments on his first post yesterday! It’s one thing for y’all to be so sweet to me, but when the love is directed toward my son, it really touches my heart. Thank you! He read every comment and was so thankful! You guys are seriously the best. Some of you also asked me to include the link to LOG YOUR EXERCISE at the top of every post, so I’ll do that from now on. Hi friends!! 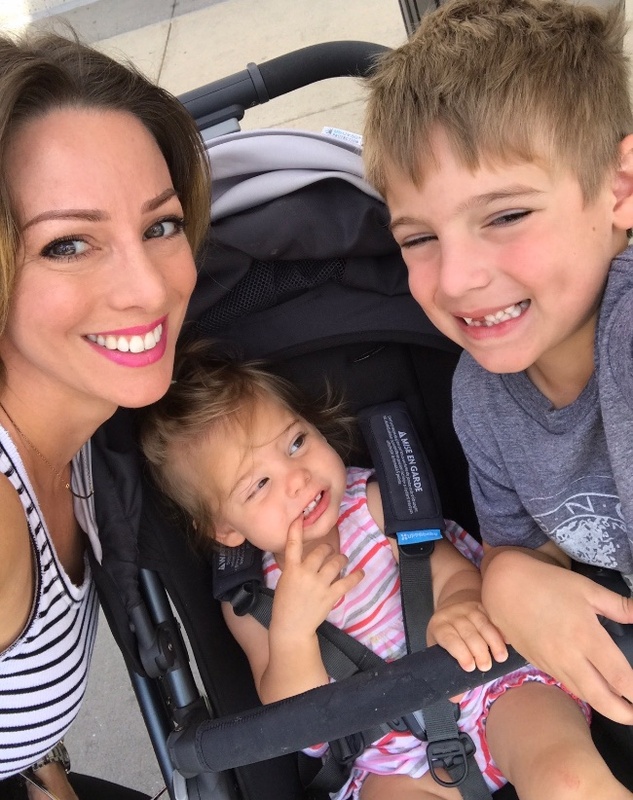 I hope you had the best weekend and a wonderful Mother’s day! We certainly did and on Sunday, we did a big grocery haul and meal prep, so hopefully this week will go smoother with healthy lunches and dinners ready to go. That should make life so much easier with all the million extra things that have been on the agenda with the end of the school year approaching. But let’s get into today’s weekend recap and microblading eyebrows review! Some of my girlfriends and I kicked off the weekend early with a mom’s pool party! Good morning friends! How was your weekend?! We did lots of celebrating around here! It started on Friday night with my longtime girlfriend Trisa’s 40th birthday party, followed by the last baseball game of the regular season, and then on Sunday, I finally got to meet the newest member of our family- my sweet nephew Carter! I’m totally smitten with him! I haven’t held a baby this tiny since Jordan! Isn’t he sweet!! I swear he’s giving me #babyfever!! Today, I’m going to tell you my secret for getting long, full lashes! You can look at the Easy Everyday Makeup tutorial to see how I fill in my brows and apply my eye makeup. Ever since I can remember, I’ve loved playing with makeup! When I was little, I used to watch my mom get ready for work in the morning and I’d tell her, I can’t wait until I can wear makeup! Later, when I got to high school, she used to let me make her up (including her hair) and it was so fun! I was also doing all my friends hair and makeup and even last weekend some girlfriends came over and I took turns curling their hair! And I got a start on planning Jordan’s 2nd birthday with one of her favorite shows as our theme- Paw Patrol! 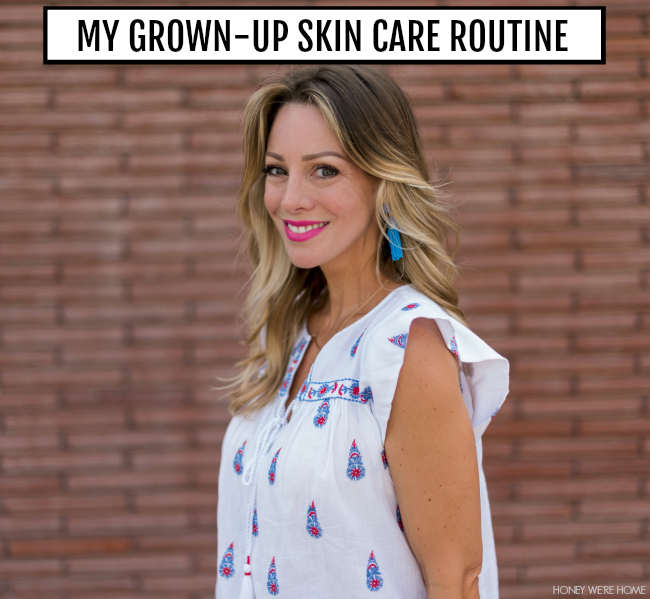 “What do you use on your face?” is a question I’m frequently asked and today I’m spilling the beans and sharing everything I swear by! I’m 42 now and have definitely upped my skin care regimen this year! I’m not sure what changed when I hit my 40’s, or maybe everything changes then! My usually good-looking skin started looking dull and didn’t have that smooth texture that I was used to. 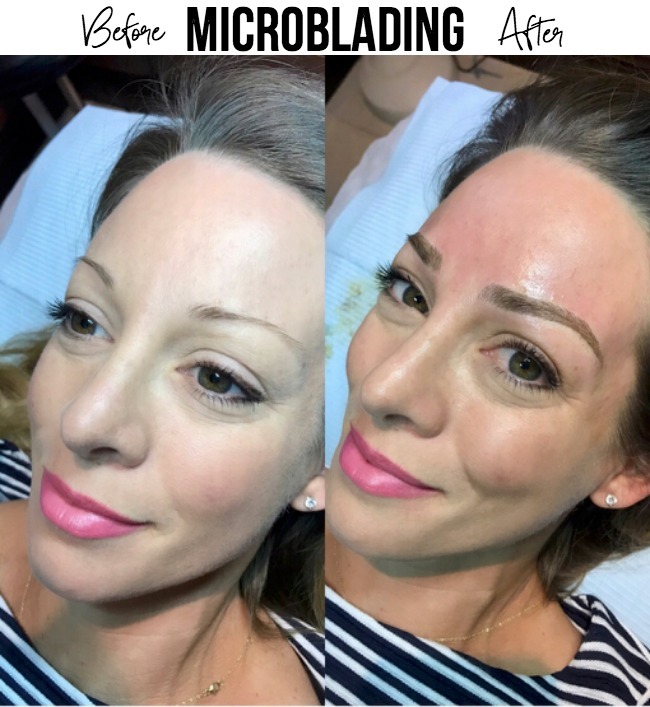 It’s been 4 weeks since I got my eyebrows microbladed and today I’m sharing all about the process with lots of before and after photos and answering all of your questions – Does it hurt? How much did it cost? It is an actual tattoo? Where did you go? Does it look real? etc. Isn’t that wild?!?! See . . . I told you I had no brows! The morning of my appointment, I snapped a picture of my face with makeup on, but no brow makeup. Happy Monday friends! We’ve got the first full week of 2017 behind us now and we’re starting to get back into the swing of things over here. But, I still didn’t finish the project post I was hoping to have ready for you today, so I thought I’d just share some highlights from this last week. First off, it got COLD here. We’ve had such a mild winter here that we were begging for cold weather and it finally hit hard! But, just as quickly as it came, it’s supposed to get back up to the 70s soon! Gah! Why does hair have to be such a drama??!?! It’s been almost a week since I screwed up my hair got lowlights and I still haven’t gotten used to it yet. It has already faded/washed out some with lots of shampooing (even liquid dish soap! ), but until I can get it ‘fixed’ I’m just living with it. And I can’t even look at my profile picture on the top right of my blog or I’ll cry! #passthetissues On the bright side, my roots are no longer a problem! And my hair looks more like Jordan’s, which makes me smile.